Most people in the digital community have heard of Facebook’s 2G Tuesdays. They were established to remind users that much of the world still accesses the Internet on slow 2G connections, rather than 3G, 4G, LTE or WiFi. For an online marketer in the developed world, it’s easy to forget about slow connections, but Facebook is particularly sensitive to them. A very high portion of their traffic is mobile, and a large portion of their audience uses their mobile device as their primary access to the Internet, rather than a desktop or laptop. Facebook and Google agree on this topic. Most digital marketers know that Google cares about latency and page speed, but many don’t realize that Google also cares about connection speed. Last year they began testing their revived mobile transcoding service, which they call Google Web Lite, to make websites faster in countries like India and Indonesia, where connection speed is a significant problem for a large portion of the population. They also recently added Data Saver Mode in Chrome, which has a similar impact on browsing. 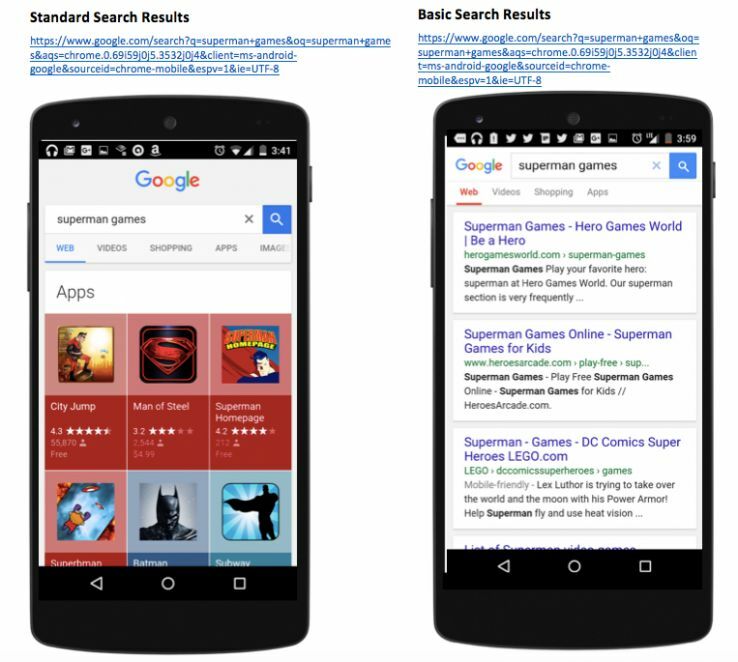 This February, Google will begin ranking AMP pages in mobile search results. These will provide mobile users access to news articles that universally render in about one second. If you haven’t seen it yet, use this link on your phone to submit a news search, and see how fast AMP pages really are. The results are quite impressive. In addition to making web pages faster, Google wants to make search results faster. They strive to provide results that send searchers to sites optimized for the device they’re searching from. They may alter mobile search results based on the connection speed of the searcher’s device. To help speed up websites and search results as the same time, Google is also striving to make Chrome faster and lighter. They’re even trying to ensure that it doesn’t drain device batteries, which is something that Android users will especially appreciate! Updated versions of Chrome actually have a new compression method called Brötli, which promises to compress website files 26% more than previous versions of Chrome. We’ll review the impact of Google’s tests on changing search results based on connection speed. We’ll outline how and why results from these tests could become more salient and impact search results at various different speeds. Finally, we’ll explain why Google has a strong incentive to push this type of initiative forward, and how it will impact tracking and attribution for digital marketers now and in the future. The diagram below provides a sneak peak of the various connection speeds at which Google products are best accessed and how these relationships will likely impact cross-device search results in the future. Notice that the EDGE connection has results that are significantly less styled and interactive than the 4G/LTE results. Serving different results for slower connection speeds is something that Google has tested before, but it’s a concept that seems to have been mostly dormant until the middle of last year, when these Basic results started popping up. Google quietly announced it on Google+, rather than with a blog post. These results are not currently re-creatable (at least for me), but the concept and eventual implementation of this kind of variability could have a significant impact on the SEO world, further deprecating our ability to monitor keyword rankings effectively. The presentation of the mobile search results isn’t all that’s. changing. The websites included and the order in which they’re ranked changes, as well. Google knows that searchers with slow connections will have a bad experience if they try to download apps, so App Packs are not included in any Basic search results. That means a website ranking in position #7 in Standard search results (after the six apps in the App Pack) can switch to ranking number one in a Basic search. That’s great news if you’re the top website being pushed down by the App Pack! The full list of search results are included below – items that only appear in one result are bolded. You may have the urge to write this off, thinking all of your potential mobile customers have great phones and fast connections, but you’d be missing the bigger picture here. First, slow connection speeds can happen to everyone: when they’re in elevators, basements, subways, buildings with thick walls, outside of city centers, or simply in places where the mobile connection is overloaded or bad. Regardless of where they are, users will still try to search, often ignorant of their connection speed. Second, this testing probably indicates that connection speed is an entirely new variable which could even be described as a ranking factor. Google’s desire to reach a growing number of devices might sound fantastic if you’re someone who’s recently updated a site to a responsive or adaptive design, but these new development techniques may have been a mixed blessing. Responsive design and adaptive design can be great, but they’re not a panacea, and have actually caused significant problems for Google’s larger goals. Responsive sites face speed and development challenges. Responsive design sites are generally slow, which means there is a strong chance that they won’t rank well in Basic search results. Responsive sites can be built to function much more quickly, but it can be an uphill battle for developers. They face an ever-growing set of expectations, frameworks are constantly changing, and they’re already struggling to cram extra functionality and design into clean, light, mobile-first designs. They can have negative repercussions. Despite Google’s insistence that responsive design is easier for them to crawl, many webmasters that transitioned saw losses in overall conversions and time-on-site. Their page speed and UX were both negatively impacted by the redesigns. Developers are again having to up their skills and focus on pre-loading, pre-rendering, and pre-fetching content in order to reduce latency — sometimes just to get it back to what it was before their sites went responsive. Others are now forced to create duplicate AMP pages, which only adds to the burden and frustration. Wearables/interactive media pose new problems. Beyond the UX and load time concerns, responsive design sites also don’t allow webmasters to effectively target these new growth channels that Google cares about — wearables and interactive media. 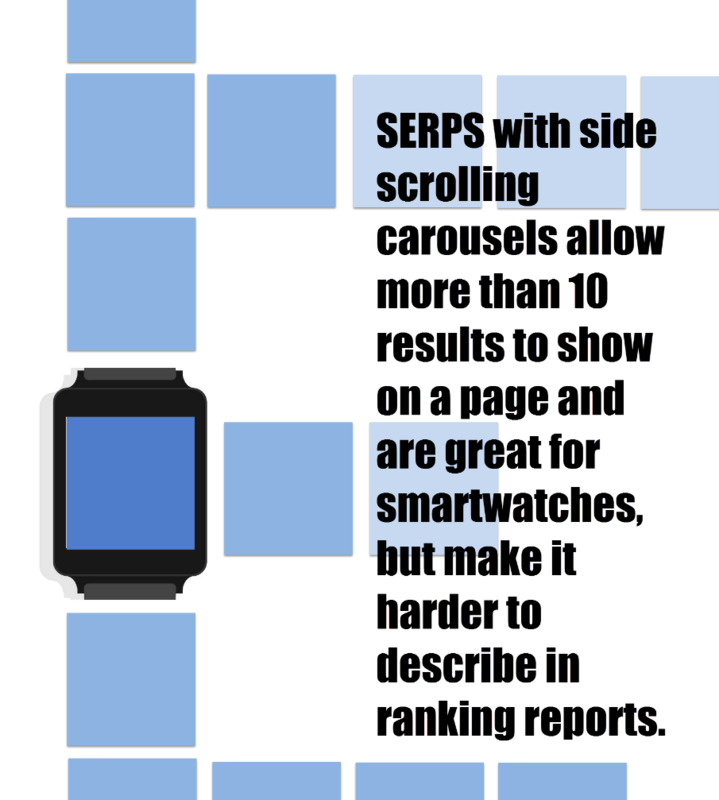 Unfortunately, responsive design sites are nearly unusable on smartwatches, and probably always will be. Similarly, Google is getting much more into media, linking search with large-screen TVs, but even when well-built, responsive design sites look wonky on popular wide-screen TVs. It seems that the development of mobile technology may have already out-paced Google’s recommended “ideal” solution. Regardless, rankings on all of these new devices will likely be strongly influenced by the connection speed of the device. Is AMP the future of mobile search for slow connections? The good news is that AMP pages are great candidates for ranking in a Basic search result, because they work well over slow connections. 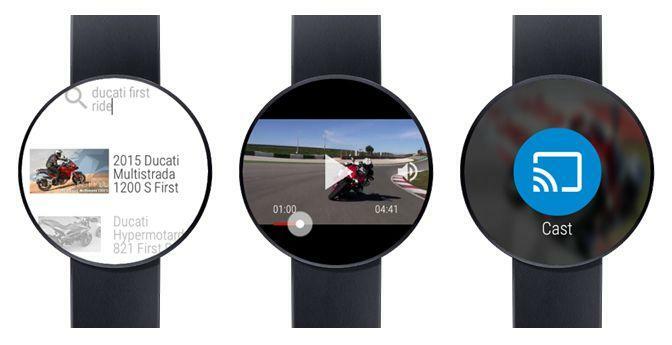 They’ll also be useful on things like smart watches and TVs, as Google will be able to present the content in whichever format it deems appropriate for the device requesting it — thus allowing them to provide a good experience on a growing number of devices. 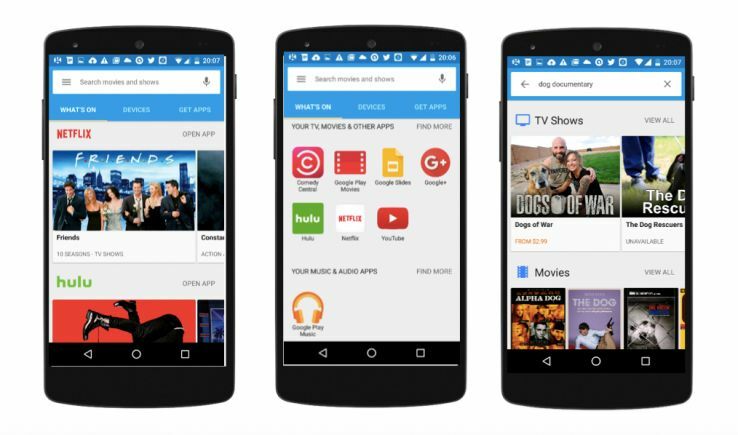 A couple months ago, Google announced the small group of apps in a beta test for App Streaming. In this test, apps are hosted and run from a virtual device in Google’s cloud. This allows users to access content in apps without having to download the app itself. Since the app is run in the cloud, over the web, it seems that this technology could eventually remove the OS barrier for apps — an Android app will be able to operate from the cloud on an iOS device, and an iOS app will be able to run on an Android device the same way. Great for both users and developers! Since Google is quietly working on detecting and perfecting their connection-speed-based changes to the algorithm, it’s easy to see how this new ranking factor will be relied upon even more heavily when App Streaming becomes a reality. App Streaming will only work over WiFi, so Google will be able to leverage what it’s learned from Basic mobile results to provide yet another divergent set of results to devices that are on a WiFi connection. The potential for App Streaming will make apps much more like websites, and deep links much more like…regular web links. In some ways, it may bring Google back to its “Happy Place,” where everything is device and OS-agnostic. How do app plugins & deep links fit into the mix? The App Streaming concept actually has a lot in common with the basic premise of the Chrome OS, which was native on ChromeBooks (but has now been unofficially retired and functionally replaced with the Android OS). The Chrome OS provided a simple software framework that relied heavily on the Chrome browser and cloud-based software and plugins. This allowed the device to leverage the software it already had, without adding significantly more to the local storage. This echoes the plugin phenomenon that we’re seeing emerge in the mobile app world. Mobile operating systems and apps use deep links to other local apps plugins. 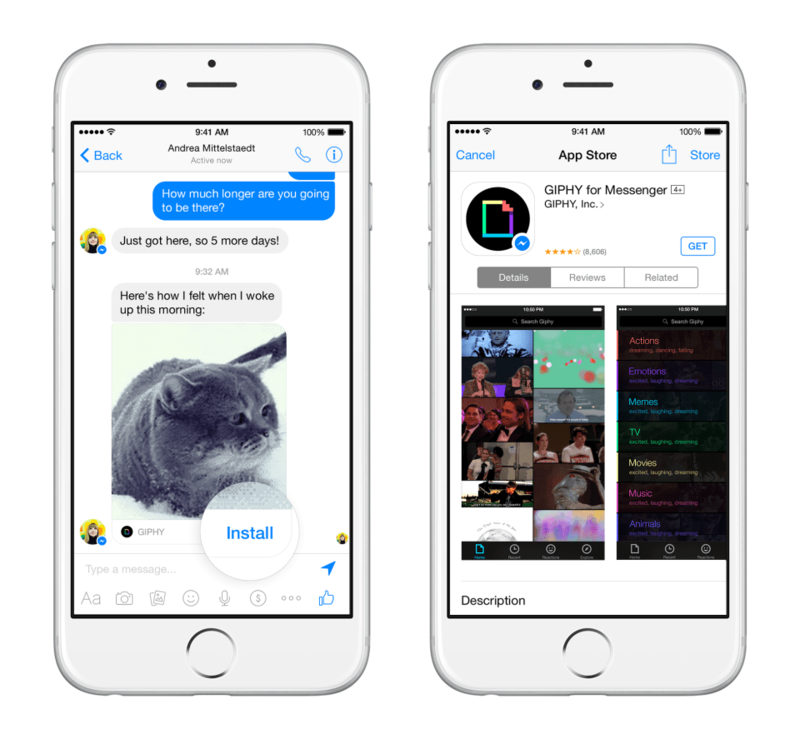 Options like emoji keyboards and image aggregators like GIPHY can be downloaded and automatically pulled into to the Facebook Messenger app. Deep-linked plugins will go a long way toward freeing storage space and improving UX on users’ phones. That’s great, but App Streaming is also resource-intensive. One of the main problems with the Chrome OS was that it relied so heavily on WiFi connectivity — that’s relevant here, too. What does music & video casting have to do with search? Most of the apps that people engage with on a regular basis, for hours at a time, are media apps used over WiFi. Google wants to be able to index and rank that content as deep links, so that it can open and run in the appropriate app or plugin. In fact, the indexing of deep-linked media content has already begun. The ChromeCast app is using new OS crawler capabilities in the Android Marshmallow OS to scan a user’s device for deep-linked media. They then create a local cache of deep links to watched and un-watched media that a user might want to “cast” to another device, then organize it and make it searchable. For instance, if you want to watch a documentary on dogs, you could search your Netflix and Hulu apps, then maybe Amazon Instant Video, and maybe even the NBC, TLC, BBC, or PBS apps for a documentary on dogs. Or, you could just do one search in the ChromeCast app and find all the documentaries on dogs that you can access. Assuming the deep links on those apps are set up correctly, you will be able to compare the selection across all apps that you have, choose one, and cast it. Again, these type of results are less relevant if you are on a 2G or 3G connection and thus not able to cast the media over WiFi. This is an important move for Google. Recently, they’ve been putting a lot of time and energy into their media offerings. They successfully launched ChromeCast2 and ChromeCastMusic at about the same time as they dramatically improved their GoogleMusic subscription service (a competitor to Spotify and Pandora) and launched YouTubeRed (their rival for Hulu, Netflix, and Amazon Prime Video). They may eventually even begin to include the “cast” logo directly in SERPS, as they have in the default interface of Google+ and YouTube. Google’s interest in varying search results by connection speed is critical to their larger goals. A large portion of mobile searches are for entertainment, and the need for entertainment is unending and easy to monetize. Subscription models provide long-term stable revenue with minimal upkeep or effort from Google. Additionally, the more time searchers spend consuming media, either by surfacing it in Google or the ChromeCast app, or through Now on Tap, the more Google can tailor its marketing messages to them. Finally, the passive collection and aggregation of people’s consumption data also allows Google to quickly and easily evaluate which media is popular or growing in popularity, so they can tailor Google Play’s licensing strategy to meet users’ demands, improving the long-term value to their subscribers. As another line of business, Google also offers ChromeCast Music and Google Music, which are subscription services designed to compete with Amazon Music and iTunes. You might think that all this streaming — streaming apps, streaming music, streaming video and casting it from one device to another — would slow down your home or office connection speed as a whole, and you would be right. However, Google has a long-term solution for that too: Google Fiber. The more reliant people become on streaming content from the cloud, the more important it will be for them to get on Google’s super-fast Internet grid. Then you can stream all you want, and Google can collect even more data and monetize as they see fit. What’s the impact of connection variability in SERPS on SEO strategy & reporting? So what might this mean for your mobile SEO strategy? Variability by connection speed will make mobile keyword rank reporting and attribution nearly impossible. Currently, most keyword reporting tools either work by aggregating ranking results that are reported from ISPs, or by submitting test queries and aggregating the results. Unfortunately, while that’s usually sufficient for desktop reporting (though still error-prone and very difficult for highly local searches), it’s nearly impossible for mobile. All of the SEO keyword reporting tools out there are struggling to report on mobile search results, and none take connection speed into account. Most don’t even take OS into account, either, so App Packs and the website rankings around them are not accurately reported. Similarly, most tools are not able to report on anything about deep links, so it’s hard to know if click-through traffic is even getting to the website, or if it might be getting to a deep screen in an app instead. In short, ranking tools have a long way to go before they will be accurate in mobile, and this additional factor makes the reporting even harder. All of these things are nightmares for the developers who write ranking software that scrapes search results. Even worse, Google is constantly testing new presentation schemes, so even if the tools could briefly get it right, they risk a constant game of catch-up. One of the reasons Google is constantly testing new presentation schemes? They’re trying to make their search results work on an ever-growing list of new devices while minimizing the need for additional page loads or clicks. This is what drives all the testing. If you think about a traditional set of search results, they’re an ordered list that goes from top to bottom. Google has gotten so fast that the ten-link restriction actually hurts the user experience when the mobile connection is good. In response, Google has started to include carousels that scroll left to right. Only one or two search results can show on a smart watch at one time, so this feature allows searchers to delve deeper into a specific type of result without the additional click or page load. However, carousels don’t appear in Basic search results. Also, the carousels only count as one result in the vertical list, but can add as many as 5 or 10 results to the page. Again, SEO’s and SEO software really haven’t settled on a way to represent this effectively in their tracking, and little has been reported about the impact on CTR for either the items in the carousel or the items below it. Not just latency and page speed, but also connection speed. While we can’t directly impact the connection speed of our mobile users, we should at least anticipate that search results might vary based on the use-case of their search and strategize accordingly. In the meantime, SEOs and digital marketers should be wary of tools that report mobile keyword rankings without specifying things like OS, app pack rankings, location and, eventually, connection speed.